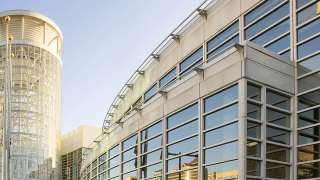 Located in the heart of downtown Salt Lake City, the Salt Palace Convention Center is easy to get to. Take the 600 South exit to either 300 West or 200 West to access the Salt Palace parking garages. The West parking lot is located between 100 South and South Temple (be in the right hand lane). To access the South parking lot, travel north on 200 West, turning right on 200 South. The entrance to the lot is on the left. Merge onto US-89 via Exit 312. Turn left on to West North Temple. Turn right on 300 South to access the Salt Palace’s south parking garage, which is located between South Temple and 100 South. Continue on 300 West to 200 South, turning left, to access the Salt Palace’s south parking garage. Head Eastbound towards I-80. Keep to the right on the ramp, following the signs to Temple Square (eastbound 269). Continue straight until you reach 200 South. Turn right. The Salt Palace’s south parking lot is located on the left between 200 West and West Temple. Follow the signs to Temple Square (eastbound 269). Continue straight until you reach 200 South. Turn right. The Salt Palace’s south parking lot is located on the left between 200 West and West Temple. Take the 900/1300/2100 South exit. Follow the signs to 900 South. You will be on West Temple. Keep left and turn on to 200 South. The Salt Palace’s south parking garage is located between 200 West and West Temple.